As part of the #FiverrHustle challenge we’re a part of right now, YOU can jump in and grab a FREE personalized Phonics Learning Set for your little one! Crafted just for you, from dozens of different activities, worksheets and games, your child will have so much fun learning to write their name, learning the sounds of the letters in their name, and learning how those sounds can be used in other words! 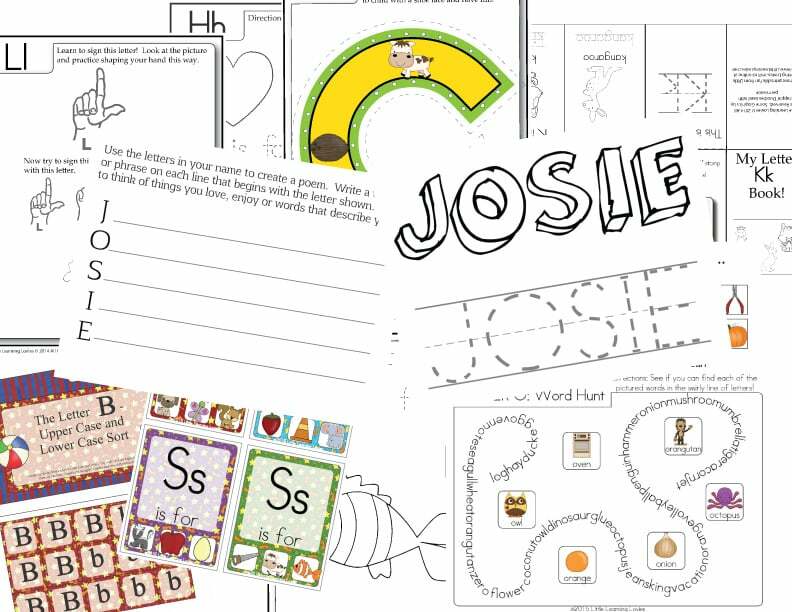 You provide the name, and we’ll create the learning experience with up to 50 activities, games and worksheets using the letters in the name you request, plus special name-specific activities, too! Help us spread the word about this gig! I get to open this to LOTS MORE OF YOU!! I can’t wait to make yours! Previous Post Be Perfect or Give Up (and other lies homeschoolers believe) Next Post It’s a CRAZY Flash Sale! ♥ Thanks for your help! Thank you so much! I just shared this on my Facebook newsfeed. Shared it to my Facebook account! I can’t wait to use it! Not sure how I am supposed to get it, it keeps asking for a credit card and doesn’t have a space for the gift code. There is a spot for apply promo code, but even with the code there is a $0.50 handling fee charge. This looks like a fun learning pack. My little boy is such a sponge and would love something like this! My children would really enjoy this. Phonics is so fundamentally important to reading and spelling success. Thank you for your hard work and offering this to all of us. Hi! Thank you for this offer! Not quite sure I follow all the instructions though!! But super excited to get this- my daughter will love it! Not quite sure I follow all the instructions though!! But super excited to get this- my daughter will ove it! Having difficulty getting the link to paste where I shared it but will try to get it to paste again. Going to do this for my 6yr and then when we get paid come buy it for my 2yr. for later. Thank you for all the creative and awesome things you make/post! I am super excited about this!! not sure if this is correct, not sure how to share the link I posted on my page http://www.littlelearninglovies.com/wordpress/2015/11/05/personalized-phonics-learning-set-free-fiverrhustle/?utm_campaign=shareaholic&utm_medium=facebook&utm_source=socialnetwork. my daughter will love this ! Hi! I am so excited for this! Thank you! Posted on Facebook and Tagged some Homeschooling Friends with little ones! This is an awesome unit! Thank you for sharing!! Hi Sandy. Just shared your personalized phonics learning set on twitter. Link is https://twitter.com/DEtrialwatcher/status/662723306391388160 and my email is leena@udel.edu Off to share on facebook now. This is a great set! Hi, I shared this on facebook! I’m looking forward to an email :):):) Thanks so much! I would love this to use with my almost 4 year old son! It would be great to add to your letter puzzles. 🙂 I believe this is the link. I shared on facebook. Not sure how to post the link, but my facebook name is Vickie Morgan. This would be an awesome pack to add to my lesson. Very neat. Would love this to go with what I’m already teaching my 4 year old. I posted on facebook!! I think the link below is the timestamp?? :oD Hope so!! Thank you sooooo much! I am so excited for this!! Not sure why my last post didn’t go through. I have shared on facebook. Thanks for the freebies. I m sure my boy will love it. I shared on my facebook page! I did it at 6:49pm EST and my FB name is Suzanne Mlg. I don’t know how to do the link though. My email is Suzanne underscore marie underscore lewis at yahoo dot com. Your the best sweets. Phonics are sometimes hard to have children learn at home. Mine lack so much motivation. 🙂 Thanks! Don’t forget to let me know where you shared this on Facebook! Just click on the time stamp of the post you used to share this blog post and copy the URL… Then reply here with that link and you’ll be added to the list of coupon winners! ♥ HURRY! I don’t know what a timestamp on fb is, I posted a link to my fb page where I shared it. sounds like just what my granddaughter needs it will be great. I thought this would be really fun! 🙂 I’m glad you do too… Don’t forget to let me know where you shared this on Facebook! Just click on the time stamp of the post you used to share this blog post and copy the URL… Then reply here with that link and you’ll be added to the list of coupon winners! ♥ HURRY! I really, really want to be one of the lucky 50 people to get this FREEBIE. I know that my kids will love it. I also have a question, I have 2 children that I would like to get this for, so would I be able to get one for each of them, so that they don’t feel left out? This will be one educational tool that I know they will LOVE with it being personalized just for them. Thanks for making this amazing freebie offer available!!! Well… I’ll be sending you a coupon, thanks to the generosity of Fiverr, which is good for $5 off for new Fiverr customers. Unfortunately, I can’t do more than that. But that means you could order two sets (one for each name) and you’d only pay $5 for them! Oh! I almost forgot… Don’t forget to let me know where you shared this on Facebook! Just click on the time stamp of the post you used to share this blog post and copy the URL… Then reply here with that link and you’ll be added to the list of coupon winners! ♥ HURRY! This is an awesome unit! Thank you for sharing! My little one will absolutely love this!! 🙂 I think it will be fun! 🙂 Don’t forget to let me know where you shared this on Facebook! Just click on the time stamp of the post you used to share this blog post and copy the URL… Then reply here with that link and you’ll be added to the list of coupon winners! ♥ HURRY!